Before I tell you.. Here is the story behind it! Adrian Png is a Senior APEX developer and he is doing a lot of things for the APEX Community. For that reason he earned the APEX.WORLD Member of the year award. 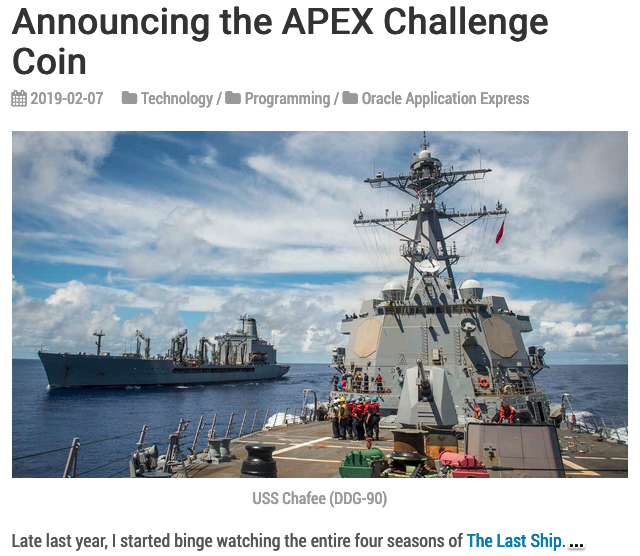 His last outstanding idea was the APEX Challenge Coin! In short: You can announce one or more great APEX developers who you think earn an APEX Coin. Of course I had to ask Adrian to send me 2 coins. Unfortunately I know to many great APEX developers only in Germany. How in hell will I ever be able to choose one??? But this is not the main reason! 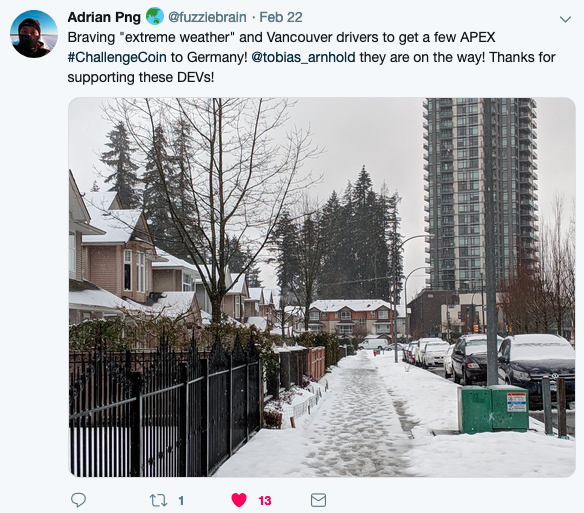 The main reason is the passionate work in supporting and helping "Woman in Tech" (WIT) to become part of our wonderful APEX community. 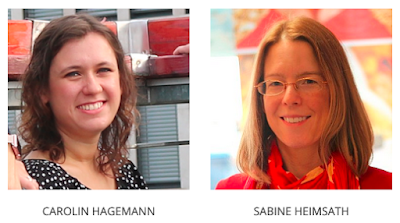 And the APEX Coin goes to... Carolin Hagemann and Sabine Heimsath ! Im Mai 2017 hatte ich euch gefragt worauf ihr euch am meisten freut was die damals anstehende APEX Connect betraf. Nun schreiben wir das Jahr 2019 und bis zur Connect stehen noch einige Events vor der Tür, bei denen es neben dem technischen Wissensaustausch vor allem auch um die Vernetzung und das teilen des gemeinsamen Spirits geht. Das nächste Meetup findet am 11.03. in München zum Thema "APEX 19.1 New Features" statt. Die anderen Meetupgruppen befinden sich noch im Winterschlaf. News gibt es aus Dresden, dort wurde eine neue Meetup Gruppe gegründet. Das erste Treffen ist bereits in Planung. 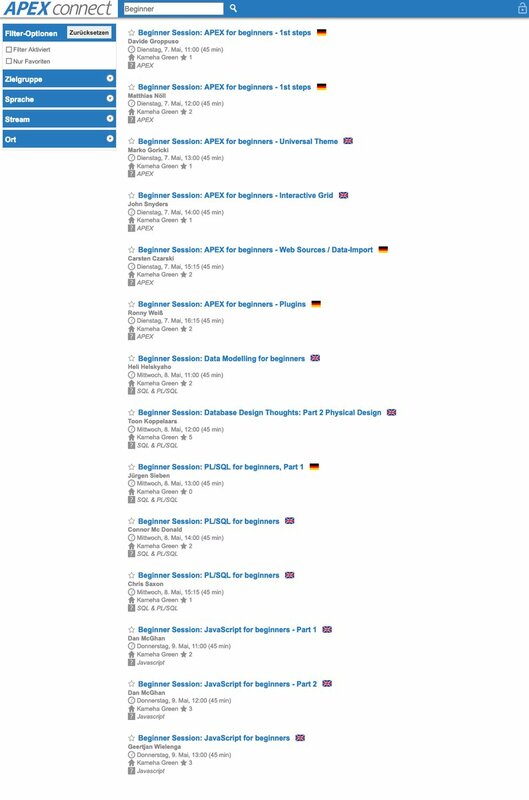 Eine Übersicht aller Meetups findet ihr auf apex.world. Eure Stadt fehlt? Ihr wollt aber trotzdem eine Gruppe gründen und wisst nicht wie? Schreibt mich einfach an (Twitter, Mail) und ich versuche euch dabei zu unterstützen. 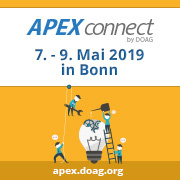 Am 18.03. findet ein kostenloser APEX Workshop in Trier statt inklusive Hands On. Beeilt euch die Plätze sind begrenzt. In Frankfurt gibt es am 13.03 einen kostenlosen Oracle Datenbank-Technologie Tag. 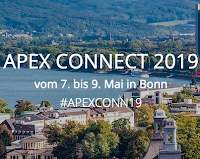 Zwischen dem 09.-10.04 bietet die MT AG einen APEX Migrations-Workshop an. 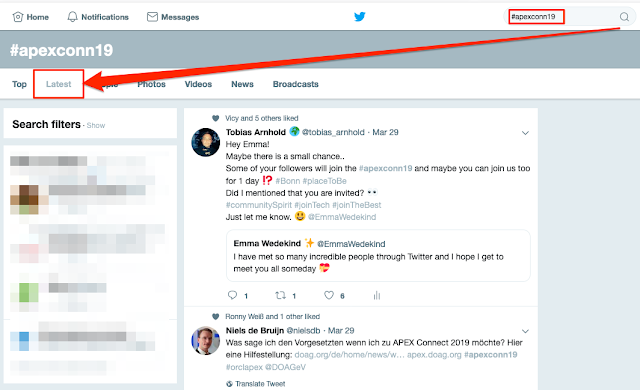 Geeignet für alle die endlich auf APEX 18.2 migrieren möchten. Die @MT_AG_ bietet einen APEX Migrationsworkshop an. Wer alte Anwendungen mit oder ohne Universal Theme hat sollte sich diesen Workshop vormerken. 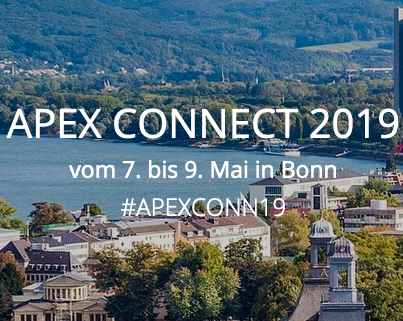 Bis zur Connect läuft parallel auch die APEX Competition 2019 bei der es darum geht ein APEX Plugin zu entwickeln. Der Gewinner erhält 850 €. Mein Highlight dieses Jahr sind definitiv die Beginner Sessions. 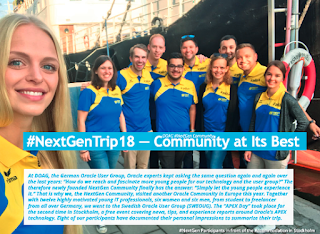 Geeignet für Newcomer, Studenten, ehemalige Forms-Entwickler, DBA's und alle die APEX näher kennenlernen möchten. In this 5 part series of blog posts I will share my understanding of how you can open modal dialogs with dynamic values. First of all: Why would you need that? There are particular business cases where your modal dialog (page 2) uses data from the parent page (page 1) which was created during runtime. I want to select a certain position from a map. The map is called by a button and displayed via a modal dialog. 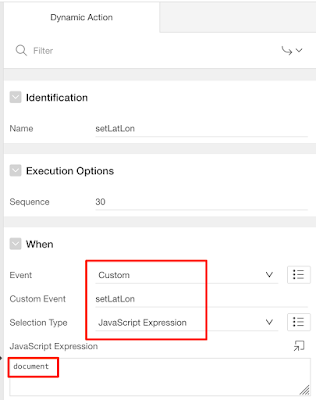 The parameter for the default position are defined on the parent page. After I have chosen a particular position on the map the Latitude and Longitude parameter should be transmitted back towards the parent page. 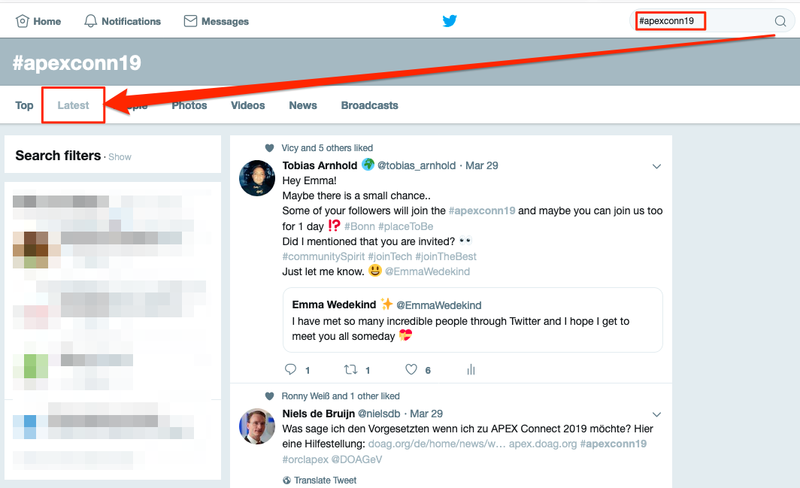 In this introduction I will explain how you can do it with "Standard APEX" functionality. On my main page 10 I have several search items (like City, Street...) , two return items (Lat, Lon) and a button called SEARCH. The button executes a standard "Submit Page". 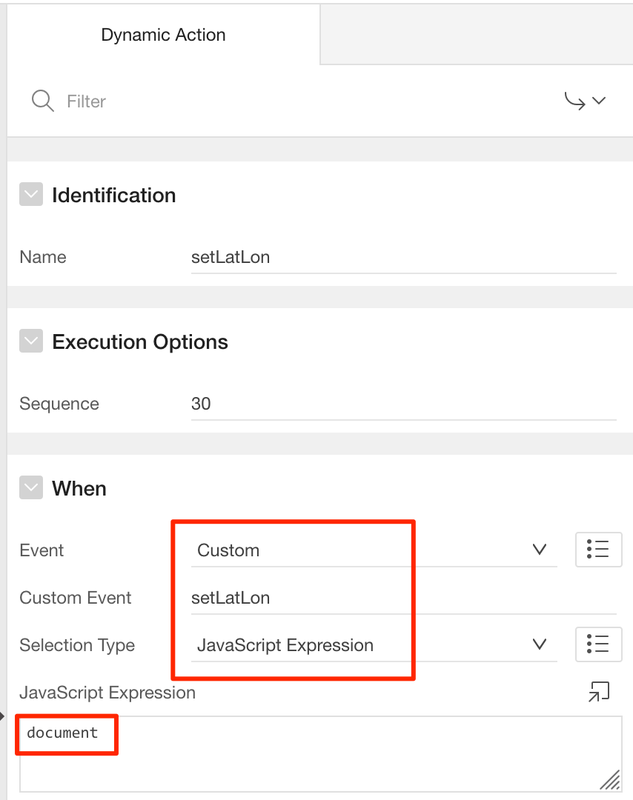 In the processing area I add a branch "After Submit" which gets executed by the SEARCH button. The branch process will open page 11 and will transmit all search parameters. In that little code snippet above I create a single string "address" and a diameter parameter to pass into the map function. Which is by the way created on page 0 as a custom dynamic action named "showOpenLayersMap". My showOpenLayersMap function is doing all the magic. In the moment the end user is doing a double click on a certain position inside the map a trigger executes a custom dynamic action on page 11 named "setLatLon". Unfortunately I couldn't find a way to send the items back to the parent page dynamically. I just couldn't react on the "Dialog Closed" event. I think it has to do with the explicit submit. The dynamic action handler has no idea about the modal dialog.